Five Pohnpei community organisations have received the news that their applications to the Pacific People Advancing Change (PPAC) Small Grants Facility Fund have been approved for funding. Staff from the Pacific Community’s (SPC) Regional Rights Resource Team (RRRT) met with each of the organisations last week (10-14 September 2018) to deliver the news and sign their grant agreements with the Pacific Community. The five organisations that have received grants are Care Micronesia, Enimwahn Development Association, Micronesian Productions, Youth4Change and the Pohnpei Senior Citizens Association. Representatives from each of the organisations were present at a oneday workshop in Pohnpei on Friday 14 September where they collectively celebrated the good news and undertook further planning to kick-start their respective advocacy campaigns within the next three months. Mr Stuard Penias, President of the Enimwahn Development Association said, “Through this grant our community will be informed about human rights, domestic violence and good governance to ensure that all men and women advance gender equality in order for us to have a productive community”. Ms Sylvia Elias, Executive Director of Youth4Change, acknowledged that the grant will enable their organisation to “mobilise and inform young people about the impact of corruption on the country’s development, so that young people can advocate for anticorruption”. RRRT has funding from the Government of Sweden to implement PPAC, focused on building the capacity of civil societies to advocate for human rights advances, as well as increasing awareness and changing attitudes within communities around human rights and gender equality. Under the first phase of the project, RRRT facilitated workshops in the Federated States of Micronesia, the Republic of the Marshall Islands, Tonga, Vanuatu and the Solomon Islands to build the capacity of civil society organisations in human rights advocacy. In the second phase, civil society organisations in these five countries were invited to apply for a small grant to implement human rights advocacy campaigns. Announcements about successful recipients from the Republic of the Marshall Islands, Tonga and Vanuatu will be made over the coming months. Recipients of the grants will receive mentoring from RRRT over a twelve-month period. 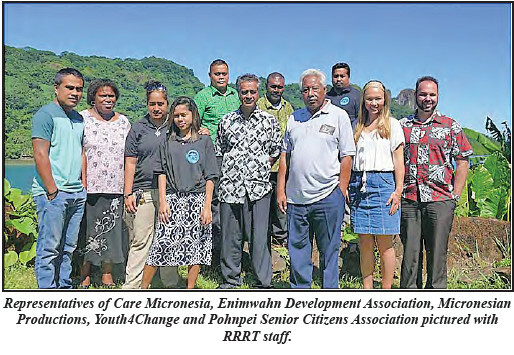 RRRT has operated for over 20 years as the region’s pioneer in human rights and gender capacity building to Pacific Island countries (PICs), institutions and civil society. RRRT provides a comprehensive suite of policy and legislative advice, technical assistance and capacity building to support PICTs in responding effectively to priority areas of human rights, such as gender equality, ending violence against women and children, disability rights, climate change, and equitable, sustainable development.